Morning friends! For a second there I wasn't sure what day it was, this week is kind of blurring together since Avery got hit with the stomach bug a few days ago and now last night it was Ella. Then around midnight it hit me and the hubs. Ugh. I really hope Brayden doesn't get it, I've seen enough puke to last me a while thank you very much. When we moved 4 years ago, Ella was an infant. 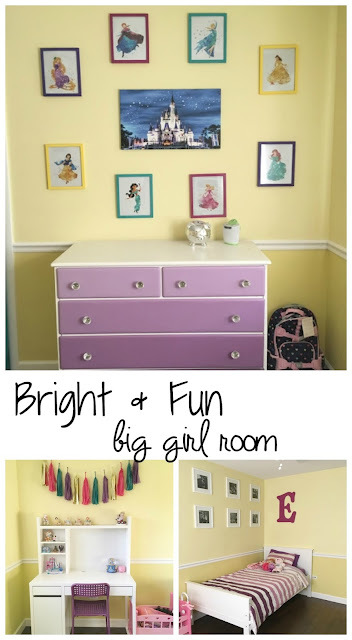 We painted her room 2 shades of yellow with plans of adding chair rail to separate the 2 colors and her accent colors were shades of purple. Her nursery was kind of just thrown together and I grew tired of it quickly but knew we would change it one day. Without further adieu - here is picture overload :) - At the end of the post I'll share a source list if anyone is interested. My SIL gets both girls a Disney Princess Precious Moment for their birthday - I love these so much and so do the girls. My Mom got Ella this Minnie precious moment for one of her birthdays - girlfriend loves Minnie! Across the room from her desk is her dresser and Disney gallery wall. I ordered those prints from Etsy and those frames were originally plain white and I painted them. The middle canvas is from Ebay. I want to get her a nightstand for the side of her bed since girlfriend is always bringing a cup of water to bed and puts on top of her headboard. Plus doesn't everyone need a nightstand?! Now it's time to work on Miss A & Brayden's rooms! So cute! This would have been a dream when I was younger! I love it, but I especially love what you did with the dresser! So cute! aww this is perfection!!! Andi is so close to a big girl room and I'm like time please slow down! Soo Soo cute! I love the yellows and purples together =) And all the precious moments...adorable!! Aaaahhhh it is SO cute. I love the colors and the ombre bedding with the ombre dresser SO cute. I have a dresser I have been wanting to paint for FOREVER! Why don't you come help me :P.
What a sweet room! Those precious moments are adorable! And I love the dresser! What a great idea! I think a night stand and cute cozy rug would be fun in that space for sure! Oh--and I love the wall colors! Yellow can be tricky! I absolutely adore this! The dresser is amazing and one that any little girl went love to have. You did so good mama! How sweet! I love that dresser, the after of that dresser is impressive! I love her room. So very cute. And I LOVE what you did with her dresser. Perfect room for a sweet girl. Her room is so bright and cheerful! My room was yellow at one point when I was little and I always loved it! And her dresser - AH-mazing! And girl, I think I may have to steal that princess idea from you... Olivia is completely obsessed with the Disney princesses (I mean, what little girl isn't?) so when the time comes to give her a big girl bedroom, we may have to do something similar. Oh no! I hope you are all on the mend quickly. Stomach bugs are not fun for anyone. Her room came together so great. I love all of the bright colors. They make me happy! Great job!! I have a few pieces of furniture that I need to paint, but I doubt they will come out as good as that dresser you painted. Whoa! Oh I love it!! I love the yellow and purple together and all the cute Disney accents! And feel better - I've been sick the past 2 days and it's no fun! Looks good! I especially like the dresser transformation.